The North Carolina Department of Transportation is in the process of completing a 5.9 mile multiple lane widening project (R-3833) from Chuckwood Road (SR 1777) to I-77, with an interchange at I-77. 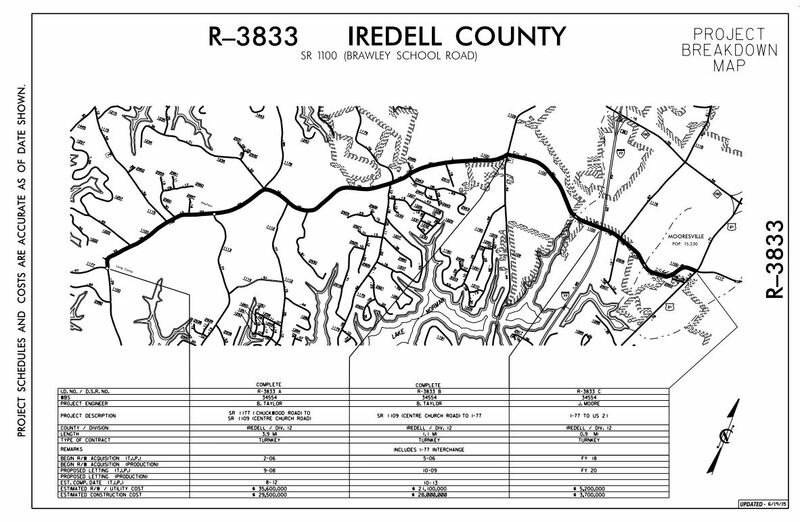 NCDOT Project R-3833, which has been divided into three separate projects (R-3833A, B, and C) has been under construction for more than 10 years. Widening projects R-3833A and R-3833B have been completed. The final leg, NCDOT Project R-3833C, proposes to widen the 0.9 mile stretch of Brawley School Road from just east of the I-77 Interchange to just east of the intersection of Brawley School Road and US 21 in Mooresville. This project also includes improvements along US 21 from just north of Dry Dock Loop & Vandalia Road to Abberly Green Blvd. It is estimated that more than 55 parcels of property will be impacted by this project. Currently the NCDOT has set aside $5,200,000 for right-of-way takings. If your property will be affected, contact one of our attorneys (two of whom previously worked on behalf of the NCDOT) for a free case evaluation.